Mohabbat Tumse Nafrat Hei Episode 26 Review – Mind-Blowing! “Suna tha jis se mohabbat krte hei us ka chehra purh lete hei, us ki ankhoon ke raste us ke dil mei jhankte hei, yakeen kr lete hei, eman le atay hei. Ye nahi suna tha ke us ki diary prhte hei aur diary ko saboot ke tor pe saath le jate hei!” Tonight’s episode had the most mind-blowing dialogues to its credit, which could only have been penned down by a writer like Khalil-ur-Rehman Qamar. It isn’t very often that you watch an episode which makes you wonder how much time the writer invested in writing such a brilliant story coupled with the most amazing dialogues which completely blow you away. Anyone out there who gave up on Mohabbat Tumse Nafrat Hei few weeks back definitely needs to catch up! Although everyone’s make-up, the picture quality and the lighting wasn’t up to the mark in this episode but even then this was yet again a superb episode which had few of the most important developments to its credit. The fact that these important developments are not being dragged definitely helps, every episode takes the story forward considerably and makes you look forward to the next episode. “Aray nahin Waqar Ahmed, tum mujhe hara ke gaye thay, shikast-e-fash hui thi mujhe. Sub ke samne mu ke bal gir pari thi mein…saans tham gaya, dil ruk gaya!” Waqar and Maheen finally met in this episode. The way Maheen welcomed Waqar was surprising and interesting as well. 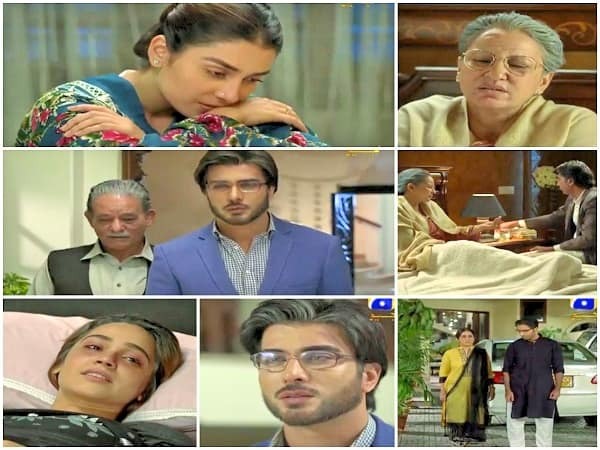 It showed how much Maheen had changed over the years, I was expecting another showdown and perhaps yet another thappar as well but on the contrary it seemed like Maheen had been waiting for Waqar to come back so that she could finally talk to him about the aftermath of his betrayal and perhaps also to find out why he went away. The way Maheen admitted that Waqar had defeated her was extremely touching especially because she was never the kind of person who would expect her defeat like that. This entire scene showed Maheen was a completely different person now, that angry girl who once had a big ego was more than willing to accept her defeat now. This was one of my favorite scenes from this episode. It would have been even better if Waqar also read the contents of Maheen’s actual diary, at least a few lines from which he could have figured out how she actually felt at that time. “Jahan meinay din likha, us ne raat likhi hei. Jahan meinay chup likha, wahan us ne baat likhi hei. Jahan meinay dard likha, wahan us ne dum likha hei. Jahan meinay khushi likhi, wahan us ne ghum likha hei!” The way Maheen explained the changes the writer of this diary made to twist Maheen’s thoughts around was beyond brilliant. Neelam’s question “jahan tum ne Waqar likha tha wahan us ne kya likha hei?” was also right on point! What a beautiful conversation, one of the many which were worth watching and listening to over and over again. Another scene which was truly impressive and soul-stirring was the one in which Munshi Alam told Waqar that people who truly loved each other read faces and get their clues from there instead of reading diaries! It was only after this that Waqar sat down to think about how Maheen stopped him and how happy she was when they were getting married. Ultimately he figured out who the real culprit was! Jia and Waqar’s meeting is definitely one I am looking forward to impatiently. Jia’s father will also reveal the truth and there is so much more that needs to be covered after this. I guess there will be two more episodes of this drama. I am looking forward to a perfect ending because right now everything is so flawless. Ayeza Khan and Imran Abbas stole the show tonight; their exceptional performances elevated the overall impact of these latest developments. Their scenes together were extremely emotional. Both these actors have done complete justice to their respective roles right from the get-go. Do share your favorite dialogues and scenes from tonight’s episode. I would love to hear from you all.